I don’t make a lot of brownies. Usually, when it’s time for a portable dessert I stick with cookies. Brownies are frequently just too dense for me to eat. However, when she who must be obeyed tells me that I need to make brownies, I usually acquiesce. This recipe actually hails from Sunday night as we decided to go out for pizza last night (I need to blame my coworkers as we were talking about a particularly good pizza yesterday; the draw was too much for me once I got home). 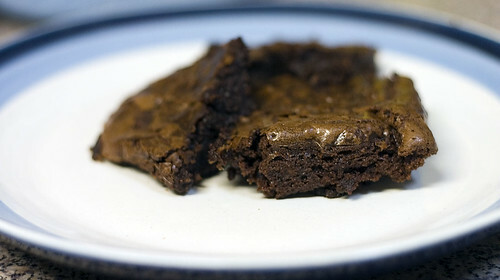 I honestly had forgotten how easy brownies really are to make (what’s the point of the brownie mixes anyway? the only part that could be conceivably hard is melting the chocolate and you could even do that in a microwave if you so desired). These brownies are not chocolate overload. In fact, they’re the exact opposite. The chocolate flavor is intense (it is only bittersweet chocolate after all) but it’s not overwhelming. Preheat the oven to 325°F. Line a large rectangular brownie pan with aluminum foil (this makes the brownies easier to extract). You may want to grease the aluminum foil. I didn’t and the brownies got somewhat stuck to the aluminum foil. 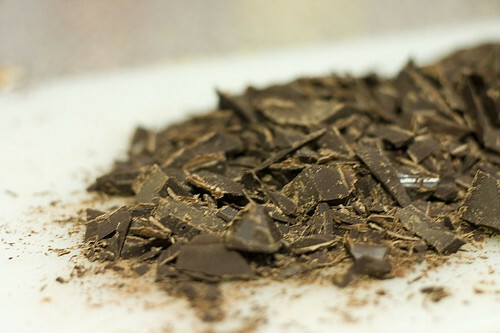 In a double boiler, melt the chocolate and the butter. Remove the double boiler from the water (i.e. take the top part off the pot), and whisk in the sugar. Whisk in the eggs one at a time. Add the vanilla extract and whisk vigorously. Whisk in the salt and the flour. Pour the mixture into the prepared brownie pan and smooth out the surface with a spatula. The recipe says to bake for 20 to 25 minutes. It took me closer to 30 to 35 minutes. Place a skewer into the center of the tray and the brownies are really done when it comes out cleanly. Remove the aluminum foil from the tray and cut the brownies to whatever size you find appropriate. Turn the brownies upside down and then pull off the aluminum foil.